Before Golden Gate Park was built there was a great debate on where the park should be located. Three choices were on the table, the current location (at that time called the "outside lands"), the presidio, and a long linear park through Hayes Valley. 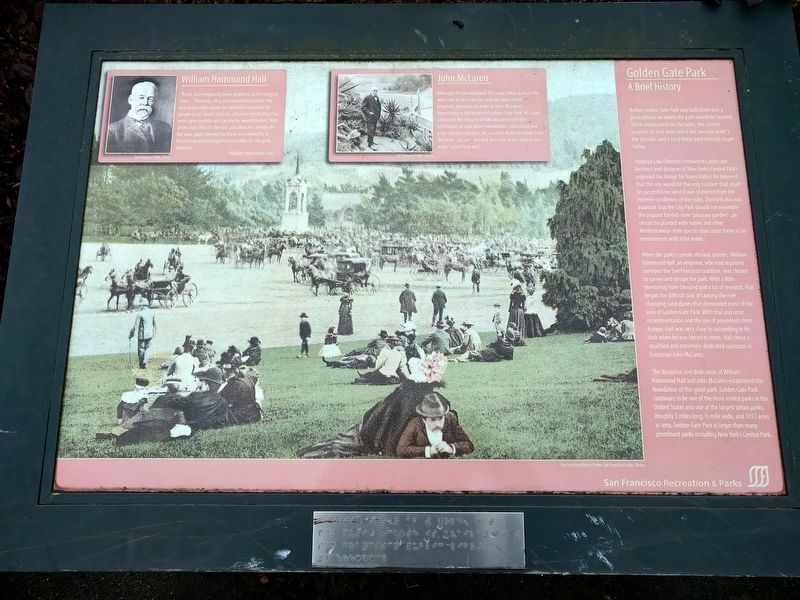 Frederick Law Olmsted (renowned Landscape Architect and designer of New York's Central Park) proposed the design for Hayes Valley; he believed that this site would be the only location that could be successful because it was sheltered from the extreme conditions of the coast. Olmsted also was adamant that the City Park should not resemble the popular English style "pleasure garden" but should be planted with native and other Mediterranean style species that couls thrive in an environment with little water. experimentation and the use of precedents from Europe, Hall was very close to succeeding in his task when he was forced to retire. Hall chose a qualified and extremely dedicated successor in Scotsman John McLaren. 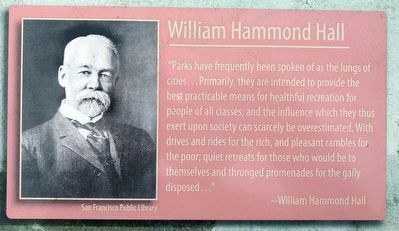 The discipline and dedication of William Hammond Hall and John McLaren established the foundation of this great park. 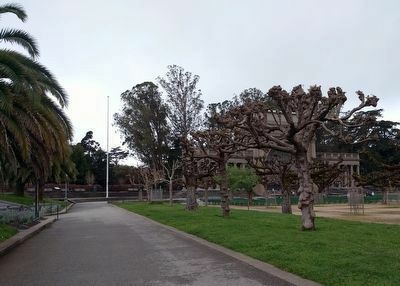 Golden Gate Park continues to be one of the most visited parks in the United States and one of the largest urban parks. Roughly 3 miles long, ½ mile wide, and 1017 acres in area, Golden Gate Park is larger than many prominent parks including New York's Central Park. "Parks have frequently been spoken of as the lungs of cities...Primarily, they are intended to provide the best practicable means for healthful recreation for people of all classes, and the influence which they thus exert upon society can scarcely be overestimated. With drives and rides for the rich, and pleasant rambles for the poor; quiet retreats for those who would be to themselves and thronged promenades for the gaily disposed..."
and perfected the techniques of sand dune remediation, silviculture and plant species selection. He created a fluid transition from he more "passive" forested west end of the park to the more "active" east end. Location. 37° 46.173′ N, 122° 28.09′ W. Marker is in San Francisco, California, in San Francisco City and County. Marker can be reached from Music Concourse Drive north of Martin Luther King Jr. Drive, on the left when traveling east. Touch for map. 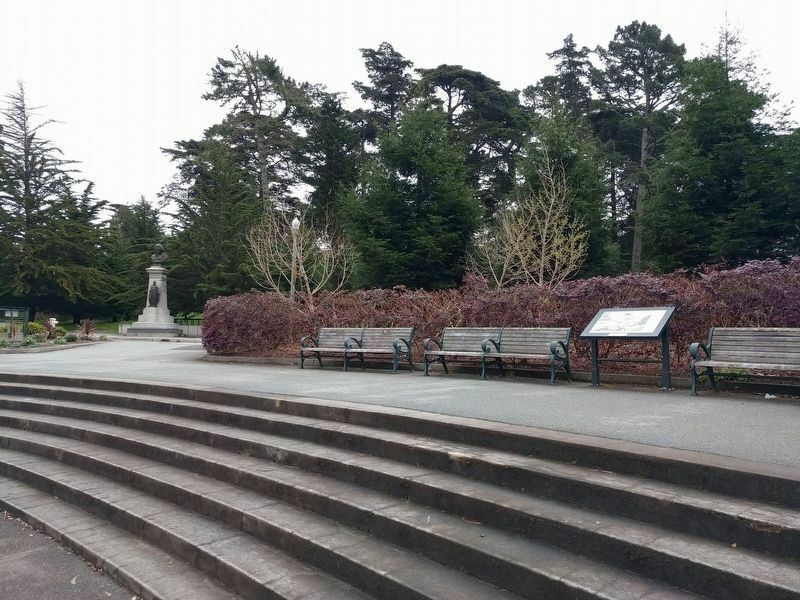 Marker is at the south end of the Music Concourse (to the left of the Bandshell) in Golden Gate Park. Marker is in this post office area: San Francisco CA 94118, United States of America. Touch for directions. Other nearby markers. At least 8 other markers are within walking distance of this marker. Japanese Tea Garden (about 300 feet away, measured in a direct line); The Music Concourse (about 400 feet away); The California Midwinter International Exposition (about 400 feet away); Japanese Tea Garden Gates (about 500 feet away); The de Young Museum in Golden Gate Park (about 700 feet away); The California Academy of Sciences (about 800 feet away); Migration of the Monastery Stones (approx. 0.2 miles away); Planning Golden Gate Park (approx. 0.2 miles away). Touch for a list and map of all markers in San Francisco. View looking east from closer to the Bandshell. The Beethoven statue is in the background. View looking to the southwest. Marker is at the end of the sidewalk and up the stairs to the left. More. Search the internet for Golden Gate Park: A Brief History. Credits. This page was last revised on April 13, 2019. This page originally submitted on April 13, 2019, by Joel Seewald of Madison Heights, Michigan. This page has been viewed 38 times since then. Photos: 1, 2, 3, 4, 5. submitted on April 13, 2019, by Joel Seewald of Madison Heights, Michigan.